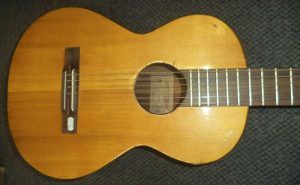 VINTAGE FRAMUS ‘FIGARO’ ACOUSTIC GUITAR. 1964. BAVARIA, GERMANY. In good honest vintage condition, no cracks or separations. 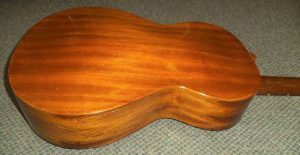 Some of the original lacquer has flaked off on both sides, which has been stabilized with french polish. 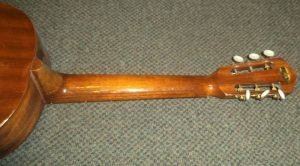 Straight neck with no fingerboard or fret wear. This was made as a classical guitar, but is currently strung with light gauge steel stings. It holds these strings well, as it has a truss rod and the original bridge has been reglued to the top. This is perfect for those with large hands.